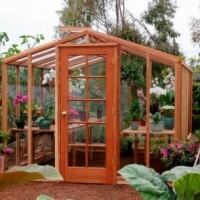 Some of the most aesthetically pleasing greenhouses can be built by acquiring discarded French doors and windows from salvage yards. The addition of a roof using solar power producing film can provide light for the greenhouse and be a source of power to circulate warm water to keep temperatures consistent. Other considerations prior to constructing the greenhouse is to assess how much time you will spend there, it’s placement in your yard and the materials you will use in construction. If the greenhouse will be visible from living areas of your home, consider the shape and materials that will be both visually pleasing and be energy efficient as well. If you plan to spend 2-4 hours a day in your greenhouse, you will also want it to be a comfortable work environment in winter or summer. Products such as Solar-Ice can lower greenhouse temperatures in daytime heat. Solar-Ice uses controlled diffusion to make more light available to plants by increasing the amount of diffused light while reducing short wave infra-red radiation. This results in healthier plants and less scorching. It also makes the greenhouse a more comfortable place to work during full sun. Plastic greenhouses are a viable alternative to glass walled greenhouses and can be constructed as temporary structures not requiring a permit. Plant production is equal to that of glass greenhouses. Walls can be constructed from readily available clear films such as UV protected polyethylene or co-polymers. Prior to beginning construction of a backyard greenhouse, you need to consider the location you have chosen. Make certain that no trees or structures are creating shade that will block sunlight. All exterior and interior walls should be painted white. Most plants require at least 8 hours of sunlight per day to thrive. Temperature is as important as light in production of healthy plants. When light levels are low, the greenhouse must be kept warm and barrels of solar heated water can help with this challenge. Soil temperature should be ambient and creating deeper beds of soil helps maintain a constant soil temperature. The creation of a watering system can be as simple as a daily routine of watering plants with a hose or watering can, or as sophisticated as installing an automatic system which activates a water supply by judging the dryness of the soil. Some gardeners place pots on a bed of constantly moist sand or a mat of synthetic fiber which functions like sand in retaining moisture. Plants thrive in many types of soil mixtures, or mixtures of organic matter without soil. The growing mixture must hold water and drain well, be porous, well aerated, and pest-free. Commercial mixtures are already sterile and my contain fertilizer, which provide nutrients for stronger plants. No need to look further than the local second hand store for many of the materials needed to construct your own greenhouse. With a bit more investment in time and money, you can even bring technology to this favorite pastime, and provide a better quality of vegetables for your kitchen table. Please remove this article as it has not been paid for. I own the rights to it at present.